MANDALUYONG CITY TOP TEN TAXPAYERS FOR 2015. 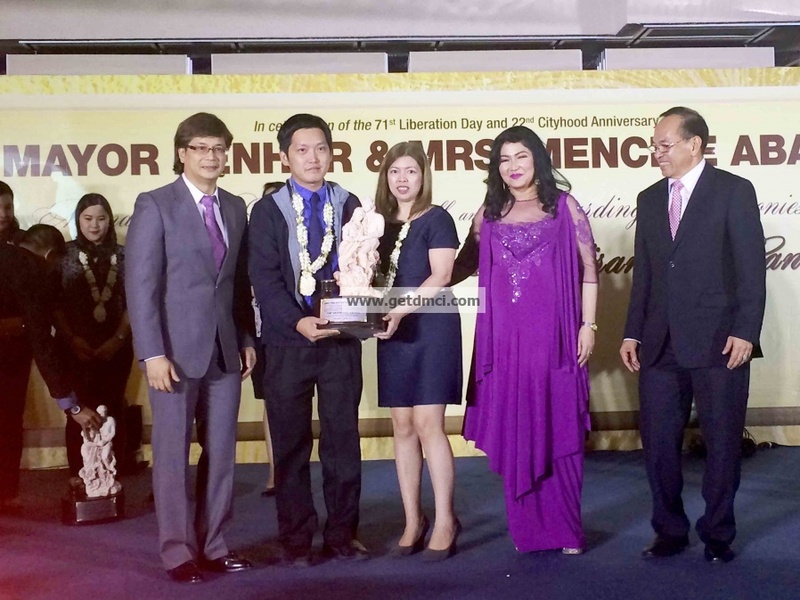 DMCI Homes representatives OIC for Project Development, Landscape and Concept Dennis Yap and Corporate Communications Manager Josephine Cruz received the award from Mandaluyong City officials led by Mayor Benhur Abalos in the recently held awarding ceremony for the city’s Top Ten Taxpayers for 2015. Held recently at the Wack-wack Golf and Country Club, DMCI Homes representatives Dennis O. Yap, Officer-in-charge for Project Development, Landscape and Concept, and Josephine Cruz, Corporate Communications manager, received the award from Abalos during an awarding ceremony which commemorates the city’s 22nd anniversary and 71st Liberation Day. “We appreciate this recognition from Mandaluyong and we are pleased to have helped the city government by just paying the right taxes,” enthused Yap. 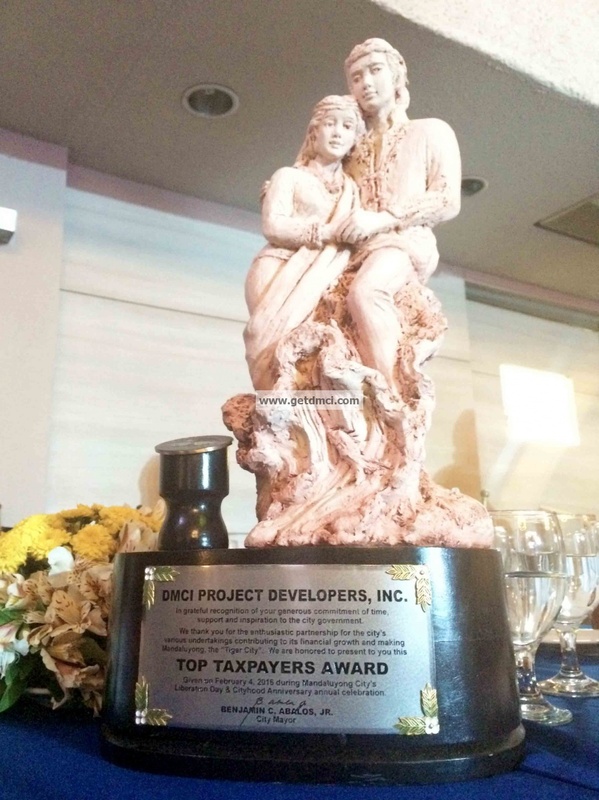 Last year, DMCI Homes received similar award when it was recognized as one of Mandaluyong City’s top ten taxpayers for 2014. “From P677 million in 2007, our city now receives revenues worth P1.6-B from businesses and real estate companies operating in Mandaluyong. Thanks to them, our projects for the city have also kept on growing and increasing,” said Abalos. 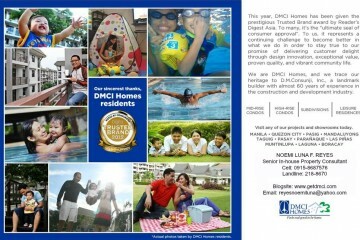 DMCI Homes also offers its latest resort-themed condominium in Mandaluyong City – Sheridan Towers. Located along Sheridan Street, Sheridan Towers boasts of its hotel-inspired facilities and design that will provide residents a more laidback and breezy lifestyle. Sheridan Towers also features Lumiventt Technology, an exclusive design technology from DMCI Homes which allows more natural light and air to permeate throughout the development’s single-loaded corridors. Aside from DMCI Homes, other companies that were recognized as Mandaluyong City’s Top Ten Taxpayers for 2015 include DDT Konstruct Inc., Major Shopping Management, Toyota Shaw Inc., United Laboratories, Shangri-La Plaza Corporation, among others.